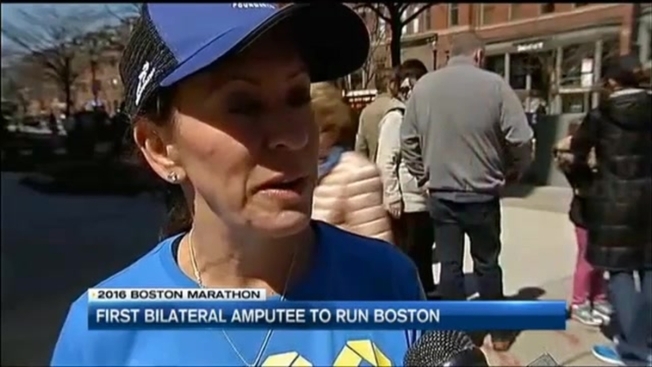 Jami Marseilles wants to be the first female bilateral amputee to finish the Boston Marathon. She admits her life story is like a TV movie, and this weekend she plans to add another amazing chapter. She already successfully ran the Chicago Marathon. "It still gives me the chills," said Marseilles. "And it qualified me for Boston." Marseilles lost her legs below the knee in 1988 when she was just 19. "I was driving home from a ski trip and wound up taking a wrong turn and I wound up living in my car in the White mountains of Arizona for 11 days," said Marseilles. "I wound up losing my feet to frostbite." Over the last 28 years, she's turned that loss into a driving passion to do the impossible. "I watched the Paralympics in Atlanta and I watched all these athletes running on these incredible, as I like to say bionic, woman legs," she said. "I thought, 'What an opportunity for me to push my body to limits that I never thought were possible.'" She's been running long distances since 2001, completing half marathons and 10 mile races and now on to marathons. Boston is extra special - she's developed close relationships with some of the marathon bombing survivors. "Some of my friends that are still struggling with what happened three years ago. Some of my friends who have been able to adapt to their prosthetics and move on. But it's still in the forefront of their lives. It's still very fresh," Marseilles said. "I never really thought about Boston, but then when it comes full circle, I thought, 'What a beautiful way to just show people across the world, no matter what trials and tribulations your life's journey throws you, you can really survive. And that's what I'm going to do on Monday." Marseilles is running with a team from the Challenged Athletes Foundation. She is also scheduled to throw the first pitch at a Red Sox game after the marathon.